My latest CD was released on May 15th. 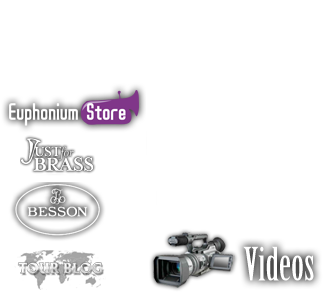 Croatian Euphonic Brass has been a really excellent project with the musicians of the Croatian Radio and Television Symphony Orchestra. This is a recording that has sounds and moments that I've been dreaming about since we discussed the possibilities with this repertoire. We planned for three years and now I'm so happy with the results. Tracks from 04 to 11 are arranged by V.Lisjak. Vanja Lisjak, is the solo trombone player with the Orchestra, but his involvement with this CD cannot be overstated. He composed or arranged all the pieces and quite simply, made this project happen. 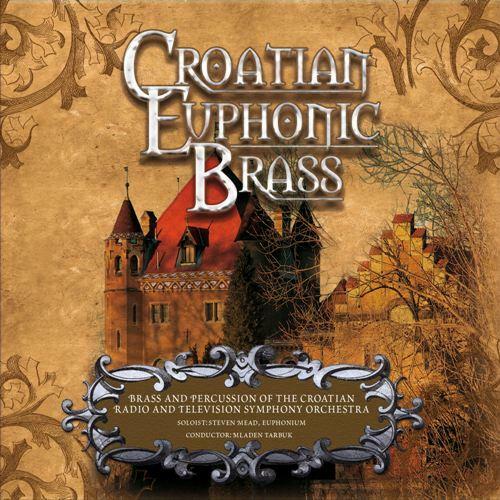 "The musicians playing on this CD are the finest brass and percussion artist in Croatia, educated in Croatia, Germany, Austria, Switzerland, Slovenia and the United States. Since 1990, almost all of us are members of the Croatian Radio and Television Symphony Orchestra, where we unfortunately have a rare chance of playing as a chamber group, as our orchestral schedule doesn't allow enough time. A concert with Steven Mead gave us a chance to show our great love for this type of music, and to unite the experience we were gaining as members of different chamber ensembles present in our country. I am very grateful for the great effort and professionalism invested in the realisation of this CD. Besides pieces written for Steven, the rest of the music on CD are arrangements of music in which i have a great affinity for ; music by H.Purcell, Orlande de Lassus, and Giovanni Gabrieli. Purcell's Music for Queen Mary has been on my mind for years. I made many arrangements inspired by Purcell's music for different brass groups and occasions, as my desire for introducing this music to audiences was almost obsessive. Appreciating harmony as a very important element in music, Purcell, Lassus, Gabrieli (as later Britten, Stravinsky,Bartok and many others) strongly influenced my style. My permanent admiration of Purcell's very advanced (for his time) harmonic approach and style, became even stronger after the first broadcast of Stanley Kubrik's Clockwise Orange. Purcell's March used as a theme in that violent movie appears on this CD as the third march, after equally mystic and heavy marches by J.Paisible and Th.Tollet. I've heard these pieces on a fantastic CD I listened to for years, so I arranged the same sequence of marches (played in Westminster Abbey during the funeral of Queen Mary) and my goal here was to preserve the special colour present when this music is played on authentic instruments (wood winds). Canzona , originally for 4 trumpets and drum, comes from the same opus by Purcell, here is presented as an arrangement for 2 trumpets, two trombones and drum. Besides the simple and beautiful anthem Thou Knowest Lord, the Secrets of our Hearts, originally for voices accompanied by brass, I arranged Praise the Lord, o Jerusalem , here as an instrumental version of Purcell's rich score for voices and choir accompanied by strings. It was demanding, yet very interesting task to make this score sound as suggestive as it does when words and voices are present, and I really enjoyed hearing it grow once we started with rehearsals. Every one of my colleagues recognised their ‘vocal' roles in this complicated polyphonic structure, and soon it started to sound as if choir was with us all the time. Madonna mia, Pieta, by Orlande de Lassus can be found in so many versions and different instrumentation. I've decided to make it simple and clear, and truly as an ensemble (choral) arrangement for seven instruments. Gabrieli's Sonata Pian' e Forte is arranged in the classical way of two quartets (for two trumpets, two horns, three trombones and tuba). It is hard to put anything new into something which is already near to perfection, still I was happy after hearing my attempt to achieve stylistic authenticity using modern notation - I was succesful. Of course, we had a great help by our conductor M. Tarbuk, who's musical knowledge and enthusiasm were of the greatest value in making this recording come true. After buying my first trombone, I started my studies, and soon the trombone took a major role in my life. Besides playing, during my studies in Croatia and Switzerland, I started to write a lot of arrangements for my chamber group (Croatian Brass quintet), and soon I was writing for many different ensembles. Enjoying this advantage of being an instrumentalist, I had a great insight into the possibilities of all wind instruments, so it seemed my arrangements were acclaimed and accepted as being very playable, still rich and demanding enough to avoid being labelled as ‘too easy' or ‘corny' (terms I don't like, as my opinion is that there are no such arrangements - just maybe wrong approaches of musicians, often tending to something; especially high, difficult, or almost unplayable). So I discovered I really like to write music, and for the last 10 years I can say I'm playing and writing with equal pleasure. The moment when I really started to feel like a person living for music and art was the moment I wrote my first original piece. I can still remember the strange and new sensation in my stomach, a few minutes before the first performance of my piece for tuba and vibraphone, and I have to admit it was quite different from any experience I had while I played as a soloist, no matter where or with whom I was playing with; a new world of sensation ! Encouraged by the good response of audiences and critics, I continued to work, and I had a great honour that my pieces were performed by some of the finest artist I ever knew including Branimir Slokar, his daughter Zora Slokar, J.F.Michele, Klemens Schnorr and Roland Szentpali. In 2008, I was commissioned to write an interesting piece for six tubas (including euphonium) and orchestra, and a colleague of mine who's the leader of very fine Croatian tuba ensemble (XL Tuba Quartet) invited Steven Mead as a guest for the big happening, the most honourable evening in Zagreb's great concert hall „Vatroslav Lisinski". Right after the first rehearsal I figured that Steven belongs to the type of musicians I like the most. I use to call this group "a bigger artist- and more human". Our first contact and conversation were comments over very fine coffee you can enjoy in Zagreb (It's true - Italians should be jealous! ), and we left any discussion about music and musicians for after the concert. The Concerto for Euphonium was quite clearly in my head even before I opened a blank page. Having Steve's skill to interpret not only musical material, but also his way of transferring energy and a message contained in the harmony, I just had to put everything on the paper. Still, I have to say that writing for musicians of such capacity is maybe easier. There are no limitations, and here I am not referring to extremely high/low notes, but to capacity of achieving exact timing while colouring certain tones within one phrase, controlling vibrato, and matching the sum of all harmonics contained in a chord played by twelve brass instruments, vibraphone, marimba and timpani ! The fact that the first movement is in a way a simple game of quasi pentatonic phrase and a rhythm pulse under it, with smooth harmony support presented no problem for Steven's comprehension. The same can be said for the second movement with its deeper insight to hidden emotions and a blue , even grey mood, with its contrasting fully romantic and haunting Waltz theme as the centre of the movement. Right after he came to Zagreb for the first rehearsal, we ran through it, and it was clear we have a match. I felt great. The Third movement is probably most cheerful piece of music on this CD. It's a lively Allegro Giocoso, with a permanent driving pulse in the brass, with slight help from the side drum, and a chance for a player to show his technique, again - I took care not to employ fingers over the limit, as I used passages and tonalities quite ‘under the fingers'. The two other pieces in which Steven is featured are Ravel's and Faure's eternal Pavanes. Knowing Steven as an utmost virtuoso, I gave up the idea of writing a piece which could outmatch pieces written for him in the recent past. Neither did I have any impulse to try anything like this. Instead, I saw a chance to engage him as an ultimate lyric voice, coated by a noble copper coat! It is fantastic how easily his sound is integrated in the brass accompaniment of Ravel's Pavane, yet still dominant by the perfect amount. Faure's Pavane is the only arrangement on this CD where I decided to use harp instead brass, and I am delighted we agreed about it, as it gives the listener a chance to enjoy a unique fusion of the euphonium's warm sound, enhanced by nice harmonies, and the calming sonorites and pulse of the harp. Our young orchestra member Mirjana Franić helped me a lot while writing this harmonically demanding music for an instrument which is always tricky, because of pedalling technique and its sonic ‘limitations'. Steven and Mirjana needed no suggestions during the first rehearsal. Everything was clear, we just had to record it". So, I cannot thank Vanja Lisjak enough for the gift of the music on this CD. His is an extraordinary talent and I enjoyed every minute of our long collaboration with this project, from our initial meeting over a coffee, to being involved with each stage of the creative process, to the live performance in Zagreb to the final result you can hear now. Croatia was a country I've never visited before, and what a wonderful place it is now. The people are passionate with a great sense of wisdom and human understanding. That human understanding is expressed so beautifully in Vanja's Concerto. It is quite unlike any of the other traditional or contemporary concerti I have performed in recent years. It has such spirit and depth of emotion. I hope to get many opportunities to perform it live in the future. It was also my first experience to perform with harp, after all these years of solo playing. Mirjana was a delight to work with, and I think we made some beautiful music together. To the ladies and gentlemen of the ensemble I say a big thank you, and what a pleasure it was to spend those happy days with you in Zagreb. I hope you enjoy the incredible sound quality on this disc too and I must say a very special word of thanks to the producer Krešimir Seletkovic as well as sound engineers Bo�idar Panduric and Andrej Rode. They worked tirelessly to produce these stunning results. I hope you enjoy it and I'd be pleased to hear your comments, of course.